Collectible angel figurineshold a special place in the hearts of many collectors. With flowing dresses and outstretched wings, angels offer a sense of comfort and peace. From artist creations to simple figurines, angels are collected by people all over the world. Many collectors of angel figurines collect angels simply because they love them regardless of the artist. However, there are many other collectors that enjoy building their collection of angels based on the works of one or two artists that they particularly enjoy. Thomas Kinkade, the renowned Painter of Light, is also well known for his beautiful angel figurines. Mr. Kinkade has designed and created many angel collections as well as angels for special occasions and causes. His incredibly touching, limited edition, pink angel Messengers From Above Breast Cancer Charity Angel Figurine Collection offers angels that give strength, comfort and hope to those afflicted with breast cancer. The Crystal Reflections of the Seasons Angel Collection features 24 percent lead crystal wings and base, a picturesque Thomas Kinkade scene on the skirt of the angel, and 24 karat gold trim. Angels of Inspiration Figurine Collection created in the breathtaking style of Thomas Kinkade, offer angels of hope and inspiration, each holding an image that is symbolic of the sentiment they inspire. Safe Harbor of Light Angel Figurine Collection inspires a calming comfort and hope in people as they gaze upon the light emitting from the lighthouse. In addition to his angel collections Thomas Kinkade also offers individual angels, such as his Winter's Blessing Angel and Christmas angels including the Angelic Voices Ornament Collection and Nativity Wreath Angels. Thomas Kinkade's angels can be found at The Bradford Exchange and are sold through the Bradford Exchange, Ashton-Drake Galleries and The Hamilton Collection. Acclaimed artist Diana Casey's inspirational collection features wolf angel art. Each beautifully detailed Native American angel has a hidden image of a wolf within the portrait on the angel's flowing dress. Ms. Casey's angels are available from the Bradford Exchange as well. There are angel figurines for those special people in your life, such as grandparents, parents and children. Professions, such as nurses, policemen and teachers also have angel figurines dedicated to them. 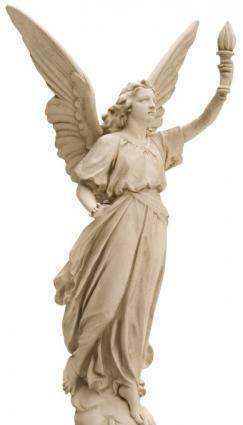 There are many artists that create angel figurines that range from exquisite to whimsical. Each tiny inspirational work of art is a treasure to behold.